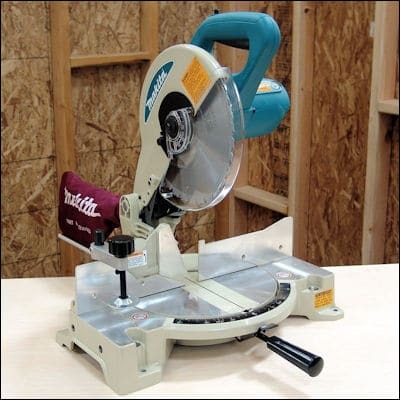 When it comes to woodworking, whether you’re a hobbyist or someone who uses it as a trade, there are few tools more convenient than a miter saw. Smaller saws might work just fine for little projects like birdhouses, hedgehog huts, and basic repairs. 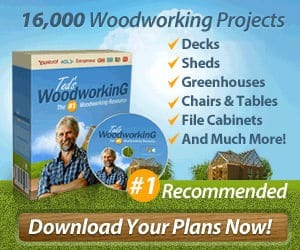 If you’re taking on real woodworking projects, however, you want a tool that’s more versatile, reliable, and powerful that can cut at new angles and work with more types of wood. That’s where a miter saw comes in. Sliding or compound: Compound saws allow you to adjust the height of the saw as you cut, but sliding saws also allows you to move the blade closer to or further from the fence. Sliding enables you to cut wider materials. Blade width: Even more important is the saw isn’t sliding, this width decides the upper limit of what you can cut. Blade guard: An essential safety feature, the more transparent and resilient the blade guard, the better it protects you without getting in the way of your work. Electric brakes: In the event of something going wrong, an electric brake allows you to immediately stop the blade and save yourself from the risk of serious damage. Marked scales and angle presets: Clearly defined settings and presets allow you to better make a variety of cuts. Cutting guide: A laser guide allows you to be precise in your cuts by showing you exactly where the blade’s going to go before it touches the wood. Dust-collection ports: This handy feature is going to make cleaning up after woodworking much easier. Take the above factors into account when making your final decision. You don’t want to jump the gun and buy a saw that doesn’t do what you want it to. This 12-inch compound saw comes with a wider blade than most 10-inch models, a thin carbide blade, and a few extra features like an encompassing dust bag and blade wrench. 15-amp provide plenty of power, while a tall sliding fence allows for work on materials as thick as five inches. The adjustable miter detent plate allows for 11 positive stops, offering more range of the kinds of cuts you can make without too much fiddling with the settings and helps you make repeatable precision cuts. Meanwhile, the cam lock miter handle and miter detent override allow for quick angles. Framing and crown molding is made easy thanks to the capacity and the regularity of cuts once you’ve found the cut you need to make. 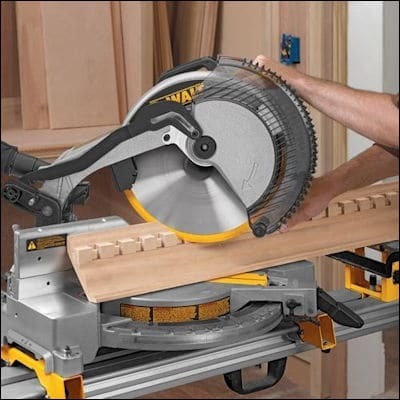 The single-bevel saw might not be as easy to make compound cuts as with a dual-bevel, but it does help the Dewalt fit in a smaller budget and makes it simpler to operate. At just 42 pounds and with an included dust bag, it’s easier to transport and clean up after, as well. If there’s one thing lacking here, it’s the electric brake for safety’s sake. 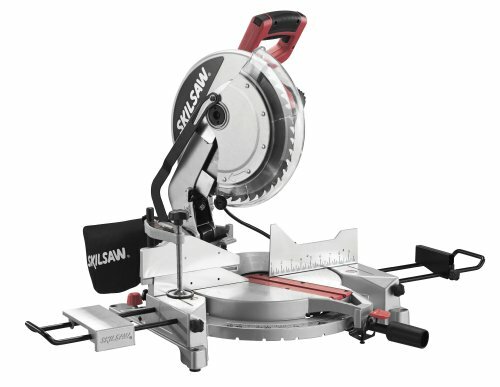 A cutting guide would have been welcome, too, but if you’re looking for a quality saw for practiced handlers on a budget this might be the one. Another compound, 15-amp, single bevel saw. The most immediately noticeable difference between this and the Dewalt is the difference in blade sizes. 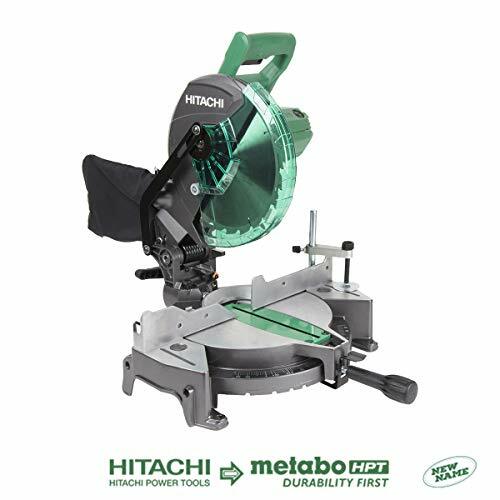 As you might imagine, this means that the Hitachi has slightly less range in the wood that it can cut, but that does help account, in part, for the lower price. 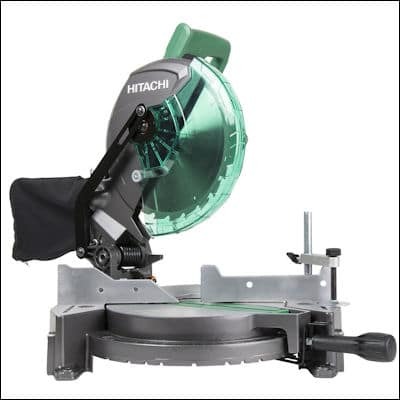 The single bevel has the same range of motion as the Dewalt, but the Hitachi offers a great range of angle on the miter, improving the flexibility of your cuts. If you’re looking for a portable tool, this might be the perfect option for you, weighing at a tiny 24.2 lbs. It’s a powerful saw with relatively no frills and represents one of the cheaper options on the menu, here. The thumb indexing for preset stops are highly intuitive, too, so finding a good cutting angle and keeping it is far from difficult. Wrenches attached, making for easier blade replacement. 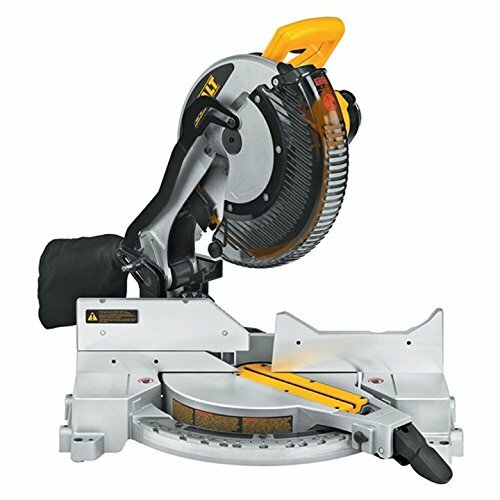 With a 12-inch blade, a very similar range of motion, and a powerful 15-amp motor, the SKIL is even closer to the Dewalt, but offers one powerful advantage that explains the slight hike in the average price. This quick mount caw comes with a laser cutting guide that allows you to make sure your blade is going exactly what it wants. A fantastic feature for new users and old-hands alike, you can use it in conjunction with the nine quick stops to make sure that accuracy and repeatable cuts are no issue. The hardened bevel stops allow for a similar range of control over a single bevel blade. At 45 lbs, it’s relative in size and weight to the Dewalt, but doesn’t have quite the capacity for boards as thick as that one offers. That said, the laser might be a deciding factor for those looking for unmistakable precision that can lower your risk of errors significantly. Another powerful 15-amp single bevel blade, the Makita comes in around the same price range as both the Dewalt and the SKIL. However, it contains a smaller blade which might urge you to ask where the extra cost is coming in. As a single bevel machine of 27.3 lbs, it seems more in line with the cheaper Hitachi, but the truth is that this is a highly resilient and well-made machine. You might be limited in the woods you can work with, and the single-bevel and miter presets allow for around the same range of motion as the SKIL. The machined aluminium base, slide rails, and carbine tip blade are made to the highest standards, however, making it one of the longest lived-machines on the list and the powerful blade ensures a smooth cutting speed regardless of load. That said, the other saws mentioned after far from flimsy, so it’s all about deciding whether you’re willing to make that trade-off. It’s a simple, reliable tool for those who know they don’t need a 12-inch blade and want a no-bells-or-whistles approach to their saw. 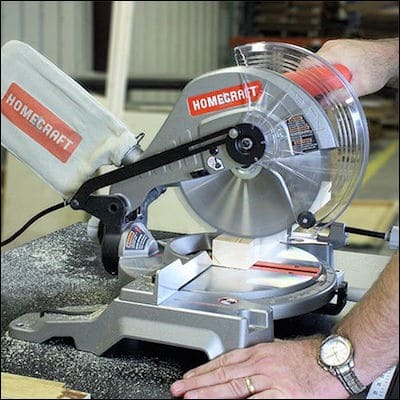 The Homecraft represents the cheapest item on the list for those looking to really stick to a budget. 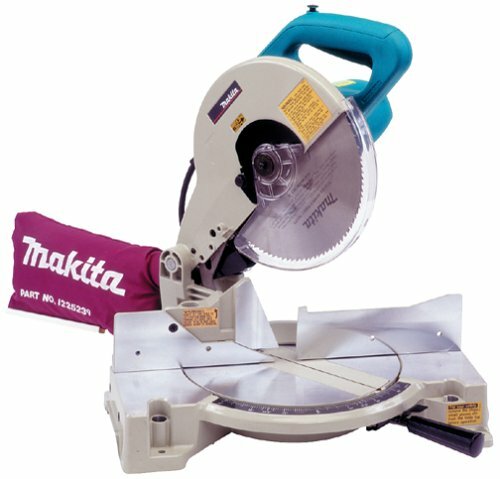 Like the Makita and Hitachi, it’s a 10-inch saw with a single-bevel that’s incredibly lightweight, but well suited to the job. 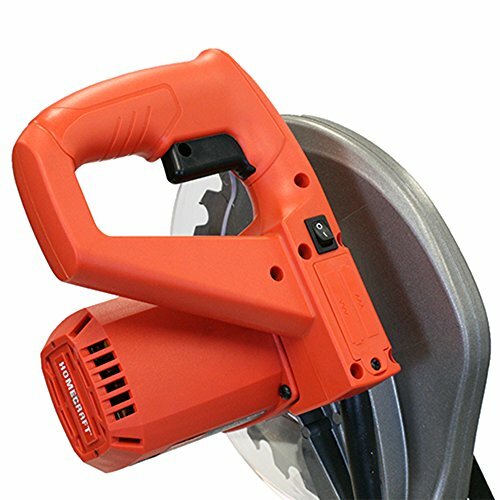 Despite its 14 amp motor, it maintains consistent cutting speeds, able to deal with both 4×4 and 2×6 pieces in a single pass. A spindle lock holds the blade in place, allowing for easy changes. Five denoted stops allow for a slightly smaller range of motion than the other blades, but are easy-to-use and accurate to their measurements. The ergonomic handle is impressively designed, too, allowing for a firm grip that can keep you working without discomfort on longer projects using more pieces of wood. 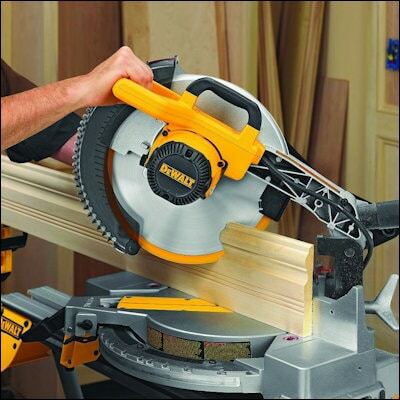 An electronic brake helps keep the saw even safer. This is an excellent blade for the price, but as you should expect, it does not allow for the range of cuts that most other blades on this list do. Lightweight unit is easy to move from room to room or even from job to job. Hopefully, you should understand by now that choosing the right saw all depends on your needs. We have looked at a range of different single-bevel saws, and for a dual-bevel tool, you might need to look into a higher price range. 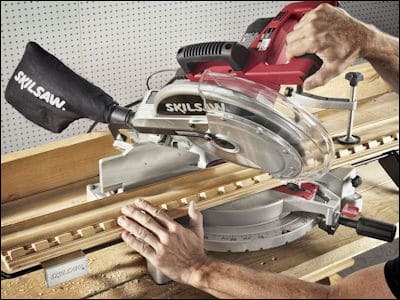 If you want to cut with a 12-inch saw for a more versatile range, however, we can recommend SKIL Compound Miter Saw with Laser. If offers almost everything the Dewalt does but with added accuracy and it’s only a tiny bit more costly.